We would like to thank Jack Feldman, Scott Adams, Rhett McGowan, Tony Scarratt, Peter Dharma, Don Boudwin and all of the other contributors to this issue of the Octagon. Also thanks to Art Isaacs for his continued work in answering members’ technical questions and answers. Be sure to send in photos and stories so we can include them in future issues of the Octagon. The MG6 Saloon will enter the British market in 2011, and be delivered to MG dealers in China at the end of November or early December this year, Mr. Chen Zhixin, Executive Vice President of SAIC Motor and General Manager of SAIC Motor Passenger Vehicle Co., said on October 18 at the UK Pavilion of Shanghai Expo, wccdaily.com reported Thursday. 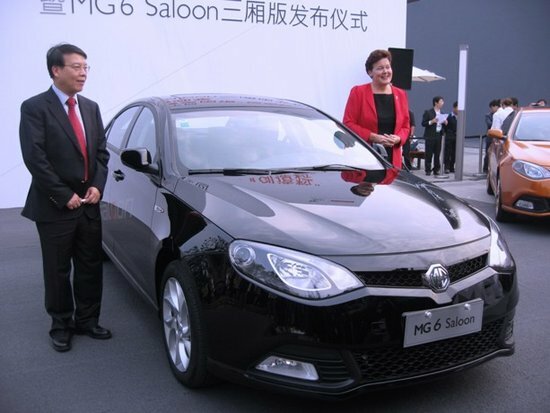 Together with Ms. Carma Elliot, Consul General of the United Kingdom (UK) in Shanghai, Mr. Chen Zhixin unveiled the MG6 Saloon (sedan) at the UK Pavilion on the same day, saying that six Saloon models featuring 1.8L and 1.8DVVT engine will be available in the domestic market. The MG6 Saloon with a 5-speed manual or Tiptronic automatic transmission measures (LxWxH) 4653mm x 1827mm x 1480mm and has a wheelbase of 2750mm (much longer than same-class models). The 1557mm front track and 1555mm rear track offers the Saloon more inner space and makes it look more practical and steadier- and thus more suitable for family use. Adhering to a sporty look of the MG models, the MG6 Saloon resembles both the MGFastback hatchback and Roewe 550 and is well positioned to meet the vitality, fashion and personality requirements of the consumers. As one of our readers, Harish, pointed out, local Omani dealer Mohsin Haider Darwish LLC is offering the compact MG 550 1.8T and the midsize MG 750 2.5 V6 only, each in a single trim level, and both built in China. The 2011 MG 550 1.8T comes with a 160 hp 1.8-litre light-pressure turbo 4-cylinder engine, 5-speed automatic, 16-inch alloys wheels, four-wheel ventilated disc brakes, cruise control, stability control, two front airbags, ABS with EBD, fabric seats, one-press engine start with the key still requiring insertion, steering-mounted radio controls, power windows and mirrors, automatic climate control a/c, CD/MP3 stereo with 8 speakers, keyless entry, illuminated sunshade mirrors, digital gauges and fog lights. The 2011 MG 750 2.5, based fully on a facelifted Rover 75, comes with a 185 hp 2.5-litre V6, 5-speed automatic, 16-inch alloy wheels, four-wheel ventilated disc brakes, cruise control, dual front airbags, stability control, ABS with EBD, leather seats, power-adjustable driver’s seat, adjustable steering wheel, steering-mounted radio controls, automatic climate control a/c, CD/MP3 stereo with 8 speakers, sunroof, keyless entry, auto headlights, cooled central cubby box, illuminated sunshade mirrors and parking sensors. Prices are reportedly higher than expected, starting above the equivalent of Dhs 60,000, though we don’t have confirmation on that. The warranty is for 3 years or 80,000 km.